Little puppies are cute when they jump up excitedly, this behavior, in a fully grown up dog is not pleasant, particularly when guests are visiting! How do you train a dog not to jump? Simply ignoring your dog when he is jumping by turning your back and looking away will eventually teach him that it no longer gets attention. One of the lovely things about coming home to your dog is that they will always be happy to see you, whether you’ve been gone for 5 minutes or 5 hours. If you encourage this excitement, it will amplify, rather than dissipate. When you come home, don’t talk in an excited, high-pitched voice and don’t look at or touch your dog until he is calm and all 4 paws are on the floor. As soon as all 4 paws are on the ground, look at your dog and tell him he is doing well. As soon as he starts to leap again, turn your back. You will find yourself turning in circles constantly during the early stages, but eventually, your persistence will pay off. Also be aware that a problem behavior often gets worse before it improves, which may make it seem like the approach is not working. Your dog has been doing the same thing for a long time, so will at first be a little confused as to why he is no longer getting the same response. The natural thing to do is to try harder, so he will leap for the skies for the first couple of weeks. Just remember, that as soon as all 4 paws are on the ground, reward him (with praise and eye contact), so he gets the idea. how to stop a dog from jumping on furniture? Unfortunately, it takes very little time to teach a behavior, but much longer to stop one. Interestingly, if you are consistent and stop everyone from looking, touching or speaking to your dog while he is jumping it will stop much more quickly than if there is intermittent rewarding (ie. If you sometimes give your dog attention, or if one member of the household gives your dog attention for jumping- so get all family members on your side). How do you stop a puppy from jumping up and biting? Why do dogs like to jump on you? Simply put, the behavior was reinforced during critical stages and extinguishing it takes persistence and a team effort from everyone your dog comes in contact with. A dog leaping up to get closer to your face is simply saying ‘hello’ and looking for attention. A few stray licks are often incorporated, so ensure you always keep your mouth closed! Chances are you push him off, thus giving him body contact, which he loves in any form. Even if you say ‘no’, your dog hasn’t learned to speak English so doesn’t understand you want him to stop. The reinforcers of eye contact, physical contact, and your voice are powerful enough to make him repeat the problem behavior. And no, shouting and violence is no good. How do I stop my puppy from jumping on the couch? How to stop a dog from jumping and nipping? how to stop a dog from jumping up on strangers? If your dog is prone to leaping all over guests or children, keep him on a lead by your side while they visit. When you hear the door, ask your dog to sit and reward this. You will initially need a helper but could use something like a Treat and Train to teach him to stay on his mat while guests visit. When the guest comes inside ask them to also ignore your dog. Keep rewarding the calm behavior and asking your pet to sit. Only allow him off-lead when you are sure he will reliably sit by your side. My dog jumps when excited. How to stop a dog from jumping on the counter? If you have some friends, ask if they can practice with your dog. The more occasions your dog has to learn the appropriate response to a visitor, the quicker he will learn. Ask them to ignore the jumping and only give rewarding attention when your dog is sitting politely. Another option for dogs that need constant monitoring when guests arrive is to crate train them or train them to sit on their bed or mat. Give them a high-value chew like a Greenie or a Pigs Ear when guests first arrive as a reward for staying put. This may not last the entire visit, but hopefully, the initial excitement phase can be diverted to chewing instead. If you know you are having a big group of people over consider taking your dog out for a big run so he is not bored and full of energy. A tired dog is not only a happy dog but a well-behaved one! It is always easier to train your dog to do something than to train him NOT to do something. Often, behavior like jumping up has been unintentionally reinforced. In the same way that your dog learned that to sit gets him praise and perhaps a treat when he jumps up you look at him and touch him. He then continues to repeat the same old pattern to get that attention. Training an alternate behavior will take a little time and persistence, but is worth it in the end. A little variation with the above methods would help. Start with a leash, award good behavior, ignore jumps and turn your back on your dog when he jumps. 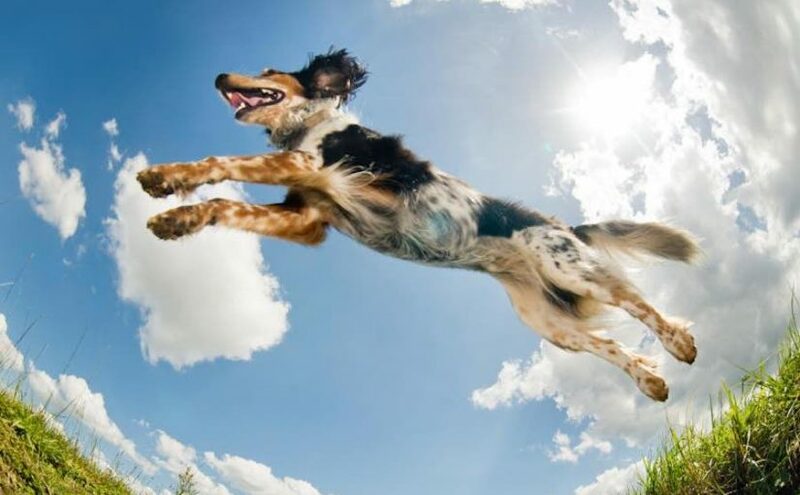 Generally, high energy dog breeds are the ones that jump the most. If the breed is a friendly one, such a dog can playfully jump on guests and strangers as well. 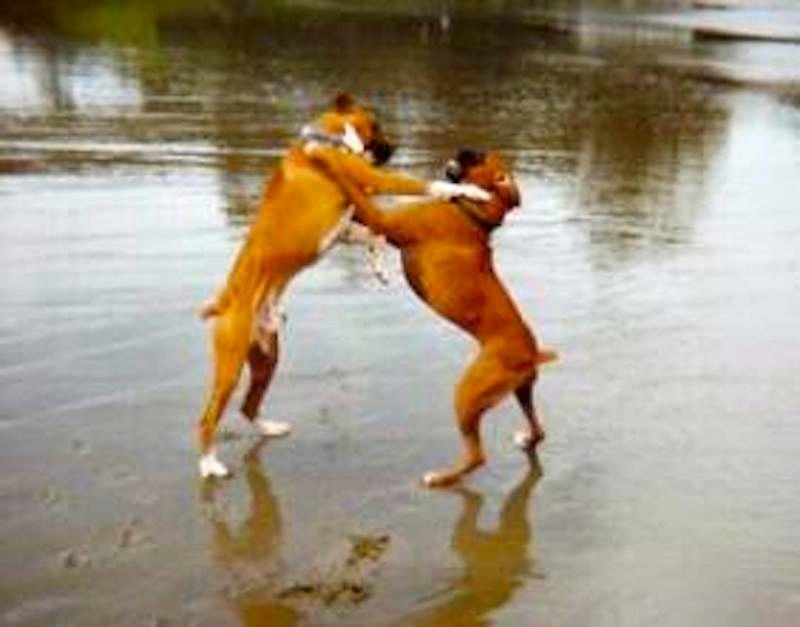 Boxers tend to jump a lot (even on strangers). Previous Previous post: Is your Labrador fat?